Come join the Encore Circle on August 31st at 9 am for a great informational and networking opportunity! This event is a gathering of people 50+ designed to connect older adults to community based opportunities to help children and youth thrive. Participants share stories about the benefits and challenges of building cross-generational connections and inspire each other to take action. 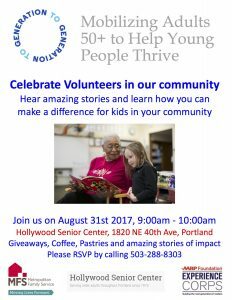 To RSVP, please contact 503-288-8303. For more information, please contact Louis Weisberg: louisw@mfs.email / 503-232-0007 x 226.